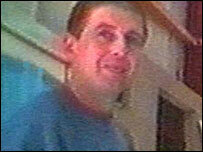 A Northern Ireland man has been cleared of the murders of 29 people who died in the Omagh bomb attack in 1998. Sean Hoey, 38, of Molly Road in Jonesborough, was found not guilty of a total of 58 charges, including those not directly linked to the bombing. Speaking at Belfast Crown Court, Mr Justice Weir was critical of police evidence and said they were guilty of a "deliberate and calculated deception". He said transcripts of the trial had been sent to the police ombudsman. 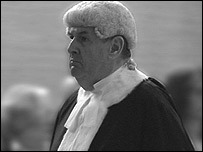 In delivering his verdict, Mr Justice Weir referred to "a most disturbing situation exposed by the defence". The judge said he was not satisfied beyond reasonable doubt that prosecution submissions showed that all explosive devices were made by one person. Speaking after Thursday's verdict, Mr Hoey's solicitor, Peter Corrigan, said his client was an innocent man who had been completely vindicated. "Today's judgement - a reasoned, lengthy and well considered judgement - completely vindicated this position that he maintained. Sean Hoey is an innocent man," he said. Outside the court, Mr Hoey's mother Rita said: "I want the world to know that my son Sean Hoey is innocent. "The authorities north and south have held two separate trials, but one witch-hunt." 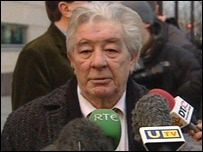 Lawrence Rush, whose wife Elizabeth died in the explosion, said the case had been handled disastrously by the police. "I wouldn't have liked the wrong man to be charged," he said. Michael Gallagher, whose son Aidan was killed in the bombing, said a cross-border inquiry into the bombing should be set up by the British and Irish governments. A police statement said they would study Mr Justice Weir's judgement in detail and would work to ensure that any organisational or procedural shortcomings were addressed. "We also await the outcome of a police ombudsman investigation into two officers who gave evidence during the trial," it said. The Public Prosecution Service said the decision to prosecute Sean Hoey was made following a careful analysis of the available evidence. Stan Brown, chief executive of Northern Ireland's Forensic Science Service, said it was now important "to take time to consider the judgment fully". At the heart of the case were the bomb timers used in the attacks. Forensic scientists had examined them for both fibres and Low Copy Number (LCN) DNA. LCN is a relatively recent development of DNA science which allows analysis of tiny samples of skin cells, sweat and other bodily fluids. The prosecution claimed that the forensic examination had shown links to the south Armagh electrician. One of their expert witnesses claimed the chances of the DNA being anyone other than Mr Hoey's were "one in a billion". But the LCN DNA results were challenged by defence experts who claimed that the scientific community is "divided" over whether the technique itself is reliable. It is believed police spent a total of £16m on their investigation. The verdict was delivered after a trial which lasted a total of 56 days over a period of 10 months. It was one of the biggest murder trials in UK legal history. In addition to the 29 counts of murder, Sean Hoey was also charged with five counts of conspiracy to murder, four counts of conspiracy to cause an explosion, six counts of causing an explosion and 12 counts of possession of explosive devices.